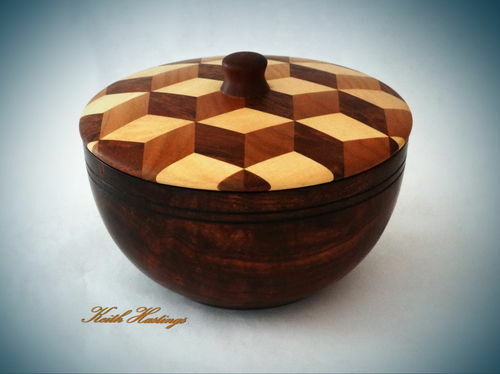 3 D Segmented bowl 200 mm in diameter x 90 mm high turned from Fijian Kauri, Kahikatea, Kauri and Jarrah. Beautiful bowl i like the 3D bottom, great work Keith. Excellent work! I like that middle, bottom section. The tumbling block centre is a real eye catcher. very cool i think thats the first 3d bowl ive seen.nice work. That is a great idea! Nice work too! Awesome looking bowl. The bottom holds your attention for a spell! I was wondering how a bowl could not be 3D, but now I see. Great work and great design. This is a total eye illusion! How many different pieces of wood did you have to have in storage to put together such a lovely composite! It’s definitely a very unique bowl for sure! 66 pieces of wood Edward and woods are Fijian Kauri, Kahikatea, Kauri and Jarrah. Here is another 3 D image you might like. It looks really extraordinary and almost impossible if you were to ask me. I think this design would simply awe many others too and can be applied onto almost anything else. It would look extremely good on a glass top dining table so that the design could be admired by many while eating. It would also look stunning on the glass doors of storage cabinets or even the front door to wow others.